Hypothalamic hamartomas (HH) are congenital non-neoplastic lesions arising from the tuber cinereum, mammillary bodies or the floor of the third ventricle with reported incidence of 1-2/million. They may present with intractable seizures (gelastic), mental retardation or precocious puberty. We report two patients of HH managed by excision through a skull base approach. Case 1: This was a first case of a 3-year-old girl brought with the complaints of episodes of uncontrollable laughter since early childhood. She experienced multiple seizures daily despite being on two anti-epileptic drugs. Developmental milestones and neuropsychological assessment were age-appropriate. Magnetic resonance imaging (MRI) revealed a 1.75 cm × 1.5 cm sessile non-enhancing hamartoma attached to the floor of the third ventricle, just ventral to the left mammillary body [Figure 1]a-d. Her hormonal profile was in the normal range. Electroencephalography showed frequent random runs and bursts of theta and delta activity, predominantly in the central leads with intermittent generalization of the slowing. She underwent left frontotemporal craniotomy with an orbito-zygomatic osteotomy (FTOZ) and a transsylvian approach using the carotid-oculomotor triangle as the approach corridor. The hamartoma appeared nearly like normal brain tissue and was shaved off parallel to the floor of the III ventricle. Post-operatively she developed transient occulomotor nerve paresis, right hemiparesis and transient diabetes insipidus, all of which resolved within a month. She is seizure free 1 year after surgery and is off all medications. 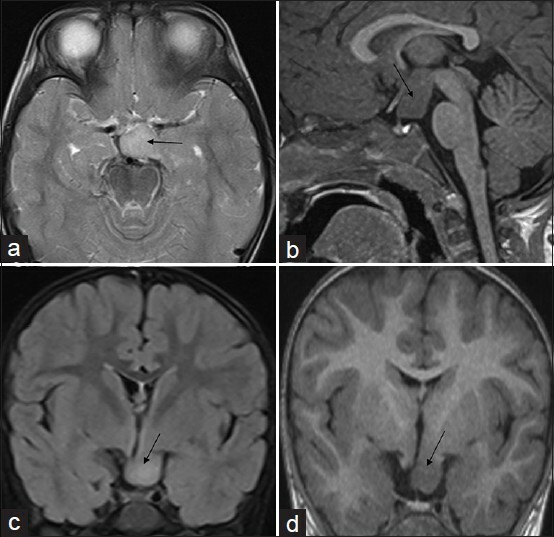 Post-operative MRI brain revealed total excision of the hamartoma with no residue [Figure 2]a and b. Case 2: The second case is about a 3½-year-old boy was brought with complaints of increasing penile and scrotal size since 8 months of age with spontaneous erections. He had early development of milestones (started walking at the age of 8 months) and was unusually aggressive. He was above the 97 th percentile of height and weight and had acne all over the body. His testicular volume was 8cc bilaterally (pubertal transition volume = 4cc). Biochemical investigations confirmed central precocious puberty with testosterone levels in the adult male range (488 ng/dl); follicle stimulating hormone (FSH) and luteinizing hormone (LH) levels were 6.44 mIU/ml and 19.12 mIU/ml respectively. MRI brain imaging revealed a 4 mm pedunculated mass between the infundibular stalk and the mammillary bodies, suggestive of a hamartoma of the tuber cinereum [Figure 3]a and b. With leuprolide depot injections at a dosage of 11.25 mg every 3 months, his aggression was controlled over 2 years and testosterone and gonadotropin levels normalized; however, bone age continued to progress and there was no regression of his testicular volume. Hence, he underwent right FTOZ, temporo-polar approach and complete excision of the hypothalamic hamartoma. He developed bilateral partial ptosis and diabetes insipidus, which resolved within the next 2 weeks. Immediate post-operative hormone levels were - serum testosterone <10 ng/dl, LH - 1.53, FSH-0.73. 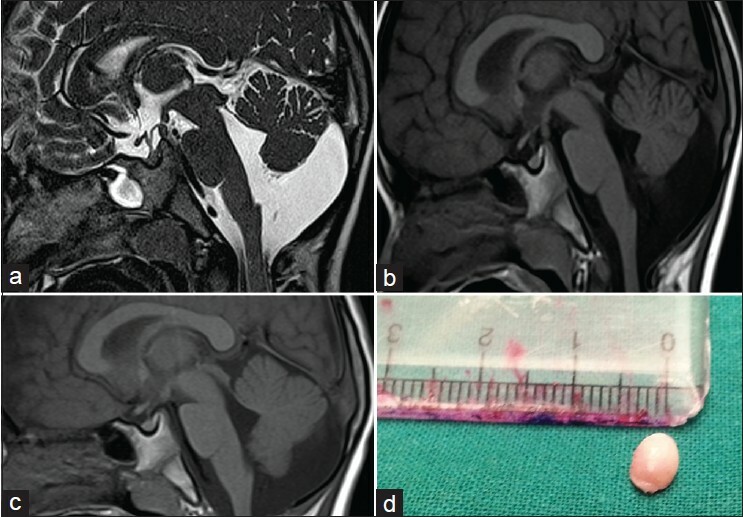 Post-operative MRI brain revealed total excision of the hamartoma [Figure 3]c and d.
Histopathology of the resected specimens in both patients revealed differentiated neuroglial tissue which closely resembled the structure of the normal hypothalamus. The thin glial layer on the surface was analogous to the superficial molecular layer of the cerebral cortex. The bulk of the nodule was composed of neurons and supportive glia with large, fully mature neurons scattered haphazardly or loosely clustered in a delicate neuropil [Figure 4]a and b.
Surgical approaches for sessile hamartomas include transventricular (interforniceal or transforaminal [open or endoscopic]) and basal approaches (pterional and orbito-zygomatic). , In sessile hamartomas with caudal extension into the interpeduncular cistern (as in the present case), a basal approach would result in less hypothalamic damage. The incidence of cranial nerve damage and perforator injuries can be minimized by performing an orbito-zygomatic osteotomy as this would allow wide sylvian fissure dissection and reduce the working distance. For pedunculated lesions, a basal approach would provide direct access to the lesion and limit damage to the hypothalamus. Less invasive approaches such as endoscopic disconnection (rather than resection), stereotactic radiofrequency ablation, chronic electrical stimulation of hamartoma have been described. , The seizure and neurocognitive outcomes with these techniques are inferior to those after direct surgical resection. 1. Rosenfeld JV, Harvey AS, Wrennall J, Zacharin M, Berkovic SF. Transcallosal resection of hypothalamic hamartomas, with control of seizures, in children with gelastic epilepsy. Neurosurgery 2001;48:108-18. 2. Abla AA, Rekate HL, Wilson DA, Wait SD, Uschold TD, Prenger E, et al. Orbitozygomatic resection for hypothalamic hamartoma and epilepsy: Patient selection and outcome. Childs Nerv Syst 2011;27:265-77. 3. Delalande O, Fohlen M. Disconnecting surgical treatment of hypothalamic hamartoma in children and adults with refractory epilepsy and proposal of a new classification. Neurol Med Chir (Tokyo) 2003;43:61-8. 4. Kameyama S, Murakami H, Masuda H, Sugiyama I. Minimally invasive magnetic resonance imaging-guided stereotactic radiofrequency thermocoagulation for epileptogenic hypothalamic hamartomas. Neurosurgery 2009;65:438-49.